By the time November rolls around in Sydney things are warming up, both weather wise and on the car Event scene. For the first weekend in November there were nine events listed on Classic Car Gurus across Australia and two of these were going down in Sydney. With the digital camera charged and the GPS showing the way my first point of call on Sunday the second was the 22nd Annual New South Wales All Chrysler Day at the Fairfield Showground in Prairiewood. 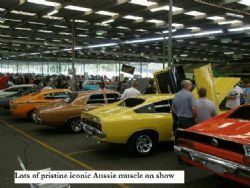 This event is open to all complianced Chrysler vehicles and on show was everything from vintage, veteran, rodded, classic and new MOPAR’s covering examples from Australia and America. As far as venues go the Fairfield Showground takes a lot of the guess work out of organising an event as it is all undercover. Picture the largest carport you could imagine, double it and add fifty percent and you get the picture. Throw in a massive car park that is easy to get in and out of, plenty of room inside for lots of cars, vendors and punters and it makes for a relaxed atmosphere with a sense of space. Judges would have had a tough job on the day due to the number of cars and the outstanding quality of most of those on show. There were a few classics resplendent with many decades of wear and tear visible for all to see which always appeals to me as a car is only original once. 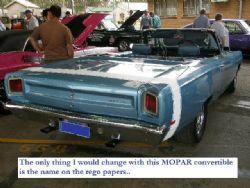 For anyone looking for a MOPAR to slip into their garage there were quite a few examples for sale. On the way in a few entrepreneurial types had managed to jag an early park in the high foot traffic areas, slip the for sale sign in the windscreen and go in and enjoy the show. Inside there were plenty of other cars on show that sported for sale signs and for anyone that had the desire and cash there were some good examples on offer. The vendors present seemed to be doing good business, particularly any selling Chrysler parts. The food stands, as always were doing well with the coffee van crew flat out trying to meet the demand and the local Rotary club had a constant queue lining up for their outstanding steak, bacon and egg and sausage sandwiches, me included. Absolutely worth the wait. As for the stars of the event, nobody would have been disappointed with what they saw. Coupes, four doors, fastbacks, convertibles, wagons, utes – they were all there. Fins, chrome, alloy, expansive sheet metal – there as well. 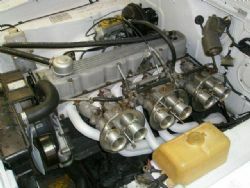 Four pots, slant sixes, straight sixes, V8’s, Hemi’s – of course. Purple, orange, lime green, yellow, red, mustard – yeah. Small blocks, big blocks, six packs....it was all good. There were a lot of clubs there supporting the event and they were well represented by a variety of body styles and years and most of the members seemed happy to have a chat to anyone interested in any of the cars on show. 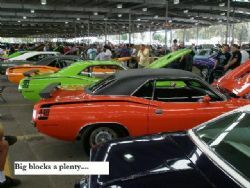 If you missed it this year you need to mark your calendar for the 1st November 2009 for the 23rd All Chrysler Day at Fairfield Showground and get along and enjoy the atmosphere, cars and a great event.